Thankfully this house has lots of storage, and the hall leading back to the master bedroom has an angled corner cabinet with a niche cut out. The storage cabinet is very useful, but the niche has always a pain in the neck to decorate. One, it's an odd shape, two, it's asymmetrical, and three, it's height. One side is wide and one is narrow, so it's difficult to choose where the focal point should be. Most accessories leave lots of blank space between the tops of them and the rest of the wall to the ceiling, leaving a lot of empty feeling space. After many different attempts over 6 years of living here, I think I finally figured it out! For a while I've had the itch to repaint our living spaces, which would be A LOT of painting so it's not on the docket any time soon. I'm really thinking about going lighter on the walls, maybe a warm white or super light tan. So, I thought the niche would be a perfect spot to experiment with a color. I chose "Shoji White" by Sherwin Williams. I'm loving it so far and wish the rest of the house would be that easy to paint! 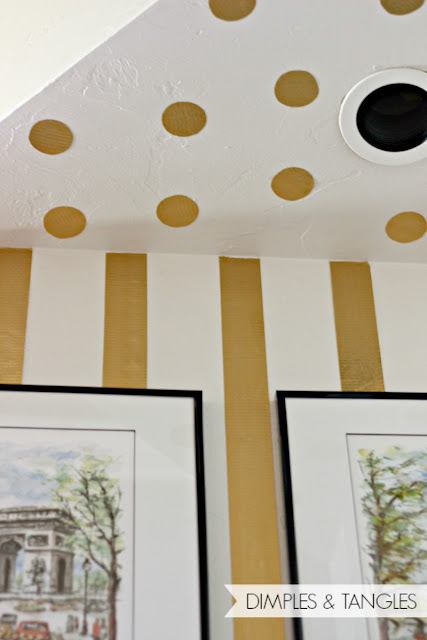 If you've been around here for a while, you might have noticed I have a think for stripes and polka dots, whether it's part of a room design or a cake! The stripes helped to fill the wall space, and the polka dot ceiling was an afterthought just to add some fun. 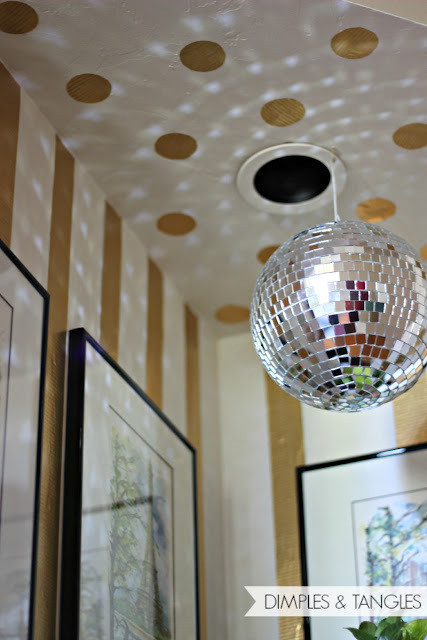 I adore all of the star and polka dot ceilings that I've seen around the web, and thought this would be the perfect place to make this weird space into something special. Normally I probably would have just eye-balled the stripes, but I knew I wanted to be hanging some artwork there that would have to be space just right, so I measured. I started with a clean edge on the top of the piece, tore a strip slightly longer than needed, applied the tape to the wall, and then used an x-acto knife along the bottom to cut a clean edge. I'm sure some will wonder, so I'll address this question. Will the tape damage the wall? Maybe. I used fresh paint on this wall, and then several days later put the stripes up. A few weeks later, I decided that they needed to be re-positioned, and as I pulled the tape off it tore a few spots of paint off. I'm not sure if the recent paint job had anything to do with it, or if the tape would normally tear the wall regardless. Mine was not really a big deal, I just painted over those spots again. Just so you know what to possibly expect. I thought about getting some vinyl when I thought of adding the dots, but just decided to use what I had and use the duck tape for the dots as well. 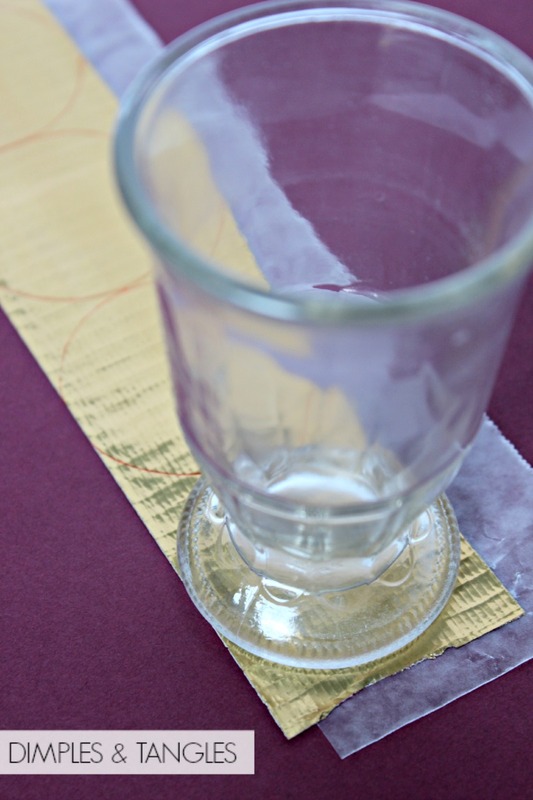 I found a glass that was just the right size to fit the width of the tape, and traced some circles out. To ease the cutting out process, I cut some strips of wax paper and stuck them underneath the tape, leaving an edge without the wax paper, so it would peel off easily like a sticker. I learned that you need to stick the tape to the wax paper, trace, cut, and peel and stick right away. I made a bunch of dots and waited a few days before trying to peel off the backing, and it wouldn't come off. Don't leave it on too long! Because I wanted to get a good idea of where the dots were going before I started sticking them up, I used pieces of painter's tape to determine their placement. My walls are lightly textured, so I tried not to press anything down too hard. It looked smoother if I applied with a light touch. If you have smooth walls would be even better! I knew almost as soon as I brought them home that I wanted my thrifted prints to go in this spot. I cut new mats using this method and put them in new frames, and I can't tell you how much I love these pictures! I'm keeping an eye out for a bust to go here, it just seems like that's naturally what needs to be in this spot! 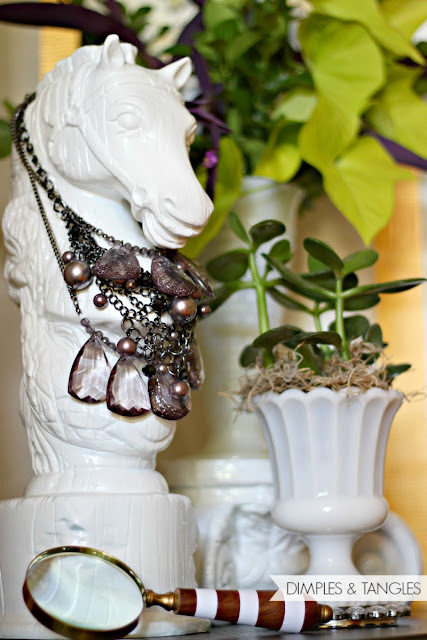 In the meantime though, I just used some greenery from the yard, and moved the thrifted horse head from the living room. It didn't stay. Maybe at Christmas, but I really want the perfect little pendant light that I can replace that can light with. Now I don't cringe anymore every time I see this spot as I walk to my room! 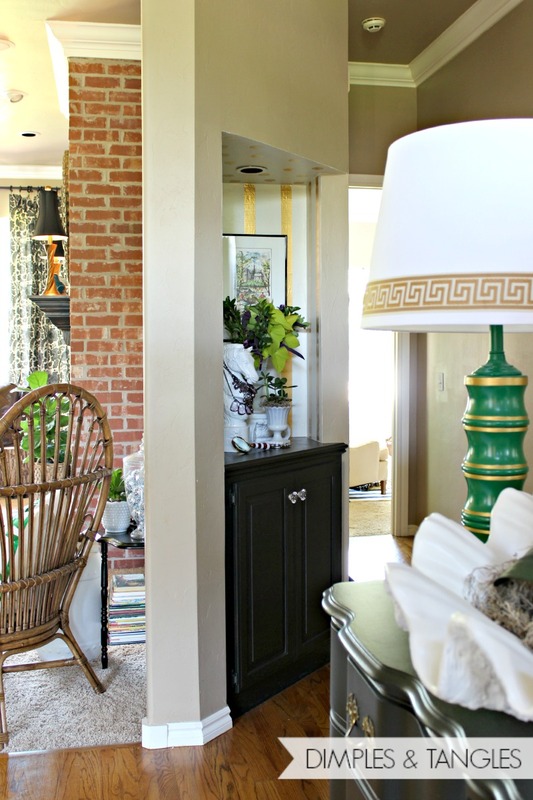 Have you used duct tape as decor in your home? I won't be posting tomorrow, but I'll see you on Monday, even though it's a holiday. I have a VERY special week planned, and you'll want to check in every day...promise! Girl, what DON'T you think of...and try...and totally pull off? Your home expresses your personality and style so beautifully. And what are you up to NOW??? I've seen that tape at the store and always wanted to buy it but couldn't figure out a fun use. Looks like you did for sure! I totally ADORE that the way you decorated that little space makes it feel intentional and useful and like a special part of your home!!! 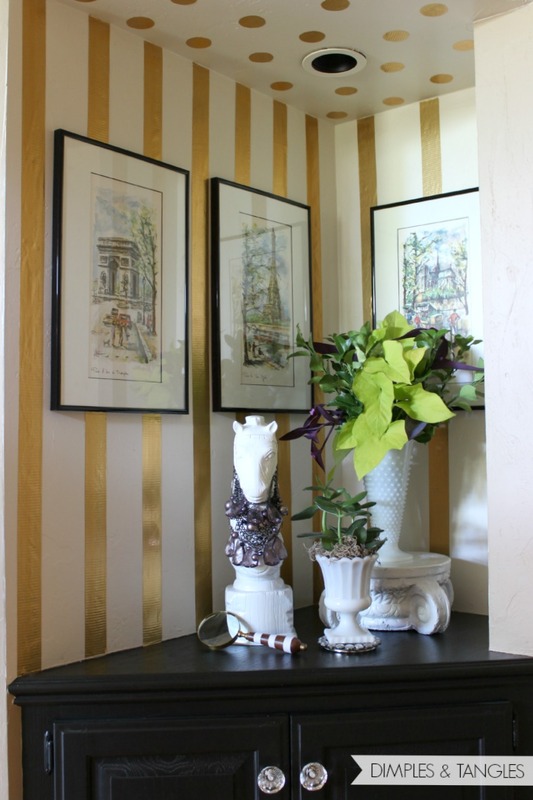 It's little nooks and crannies like that that I love about homes, and the gold stripes and dots with the contrast of the black cabinet, along with the art - perfection!!! You, my friend, are a genius! Pinning. shut the front door! i LOVE that and it's the perfect space for it!!!!! Super cute!!! I love the gold...and the necklaces on the horse are just perfect. It turned out perfect!! I love it! Duck tape - who knew?!? 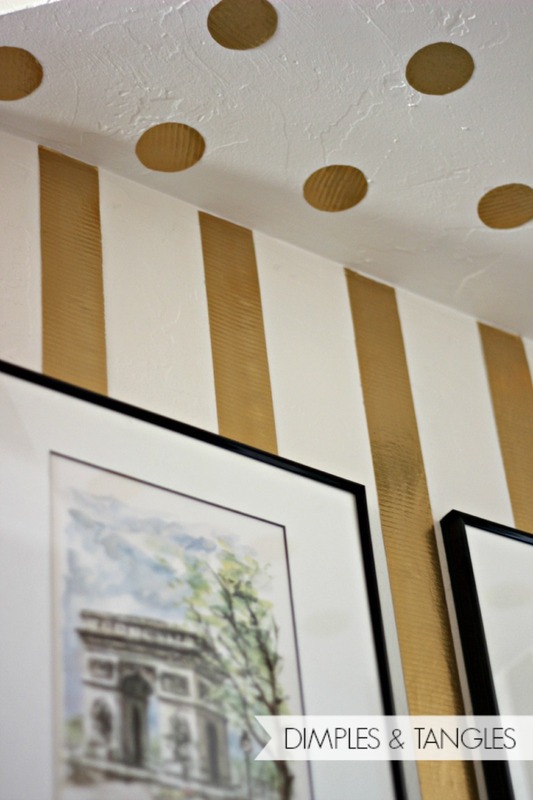 I would have never thought of using duck tape to create a design on the walls, such a brilliant idea! 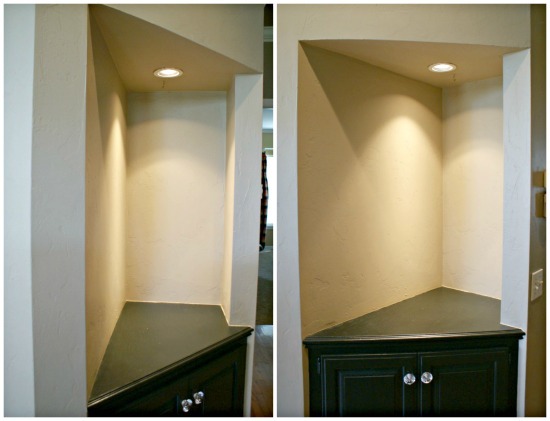 Your once odd shaped nook looks absolutely gorgeous! Looks fantastic! And using the duct tape is genius! That looks so awesome. I immediately thought you used vinyl for your polka dots, never would have thought it was duck tape! Love it !!!! Can't believe that is "duck" tape. SO darn cute ~ the perfect dose of playful and stylish! I thought it was going to be in Emily's room ~ bet she'd like it there! A pendant would be fabulous in there, too! You already know that I love this :) I guess I need a disco ball in my powder room now too. Love it! I LOVE this little nook :) It's awesome!!! Such personality and very creative, Jennifer! Love what you've done with your nook! The gold looks beautiful and the artworks is really lovely. As you look for the 'perfect' fixture, check out the pendants sold by Home Decorators that screw into existing recessed lighting. The one with all the clear jewels would look amazing in this nook! Gorgeous! I LOVE the stripes and polka dots! 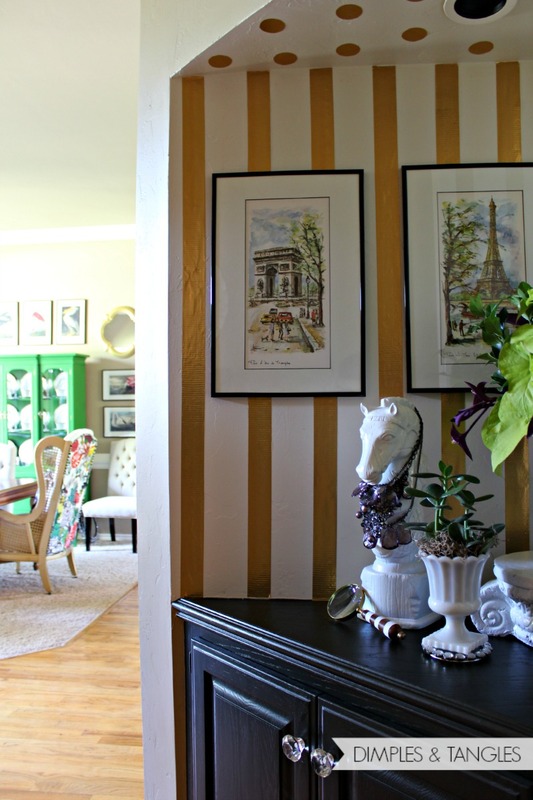 Love the stripes and polka dots! So cool! You took an awkward spot and made it look like it was planned that way all along. Great job and wonderfully creative. Thanks for sharing such good ideas. I want to paint our living spaces that exact color, but it will be a big job so I'm putting it off :) love how your little nook turned out! Oh my gosh, how stinking adorable is that? I LOVE IT! How cute! My daughter recently added gold stripes and dots to a drink dispense set she found at Target. Just the right touch. Your little niche is no longer plain and boring. And I love the idea of a little pendant light. Great job, Jennifer! Cute!!! I think its smart to test out a new color in that little niche too! What a cute idea. I love that you used tape. Thanks for linking up. 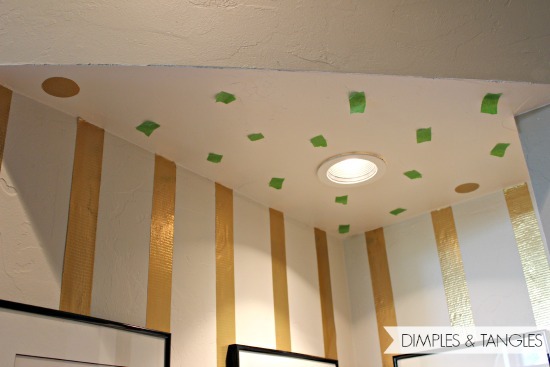 I actually thought about using duct tape to get perfect stripes on a small accent wall. This has given me the courage to try it. I am looking these kinds of grate style and I found your blog. I'm relocated and I've been things to do. I want to hire the best of Home Remodeling Contractors. Your content is really appreciating. Genius lady! Pure genius! I love it. I would have never guess that is "duck" tape. I love it. Really like this idea. Pinning it. We have a niche in our foyer too which is the toughest spot to decorate in our home. I have that same horse head, but mine is a lamp. Was yours a lamp, too? 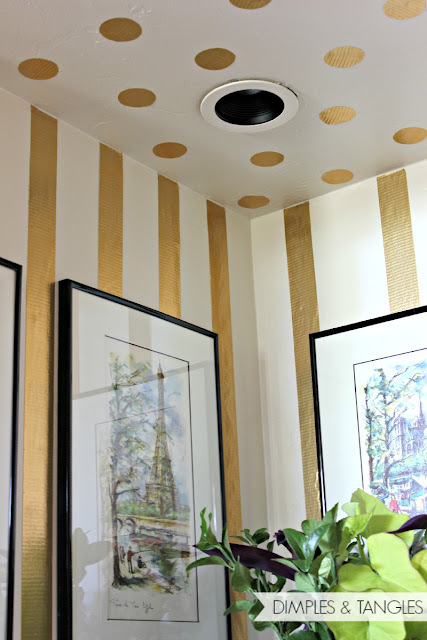 I have been toying with the idea of doing a gold duck tape accent wall in my bedroom. How much space did you leave between each stripe? Looks great, by the way!